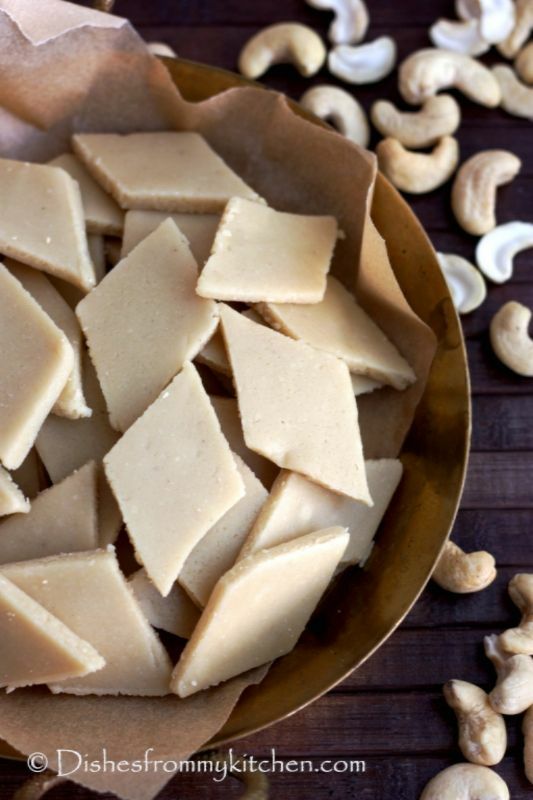 Kaju Katli/ Cashew nut fudge is very easy to make, with few ingredients. 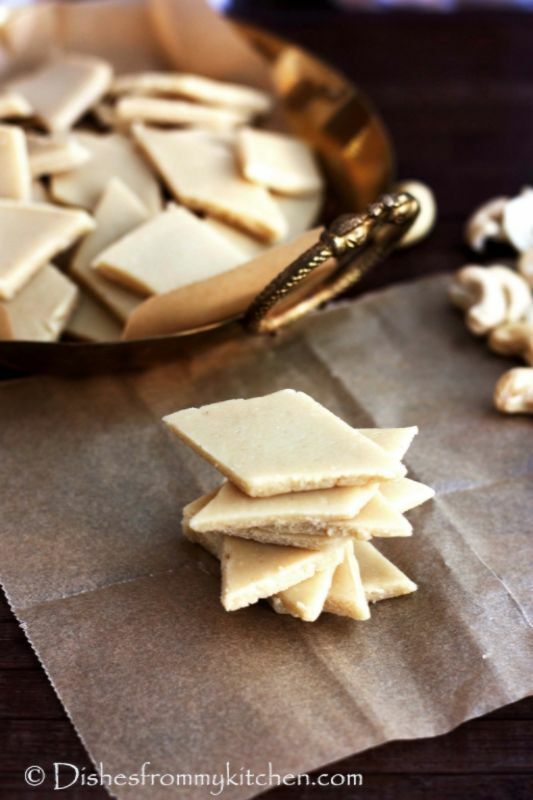 It’s one of the most popular sweets and almost every one's Favorite. Its perfect dessert/sweet which can be gifted to friends and family for any occasion. Enjoy this yummy rich dessert ! I did not use any flavoring as we like katlis as is. If you want you can use either use Kewra Essence (1 drop) or Cardamom (1 pinch). 1. 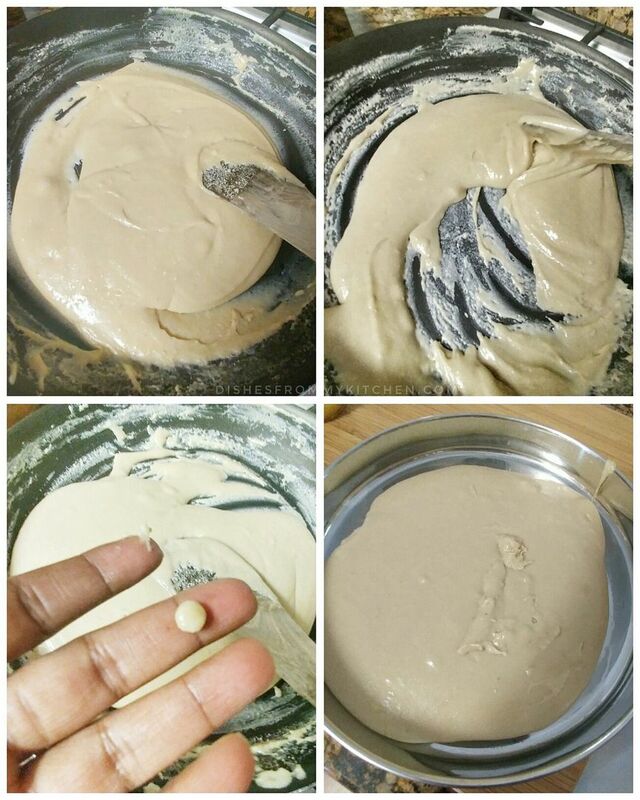 Powder the cashew nut finely in a dry mixie/blender jar. 2. 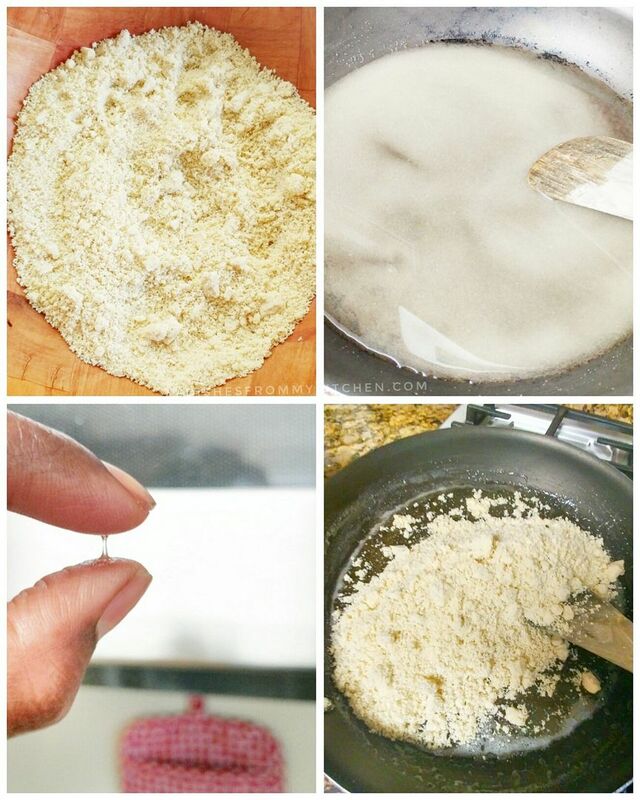 Mix sugar and water in a pan using a spatula. Once the sugar slightly dissolves switch on the flame, always keep the flame in low to medium. 3. At first the sugar starts to dissolve and you can see slight bubbles, after that sugar syrup starts to thicken. 4. Now we need to check the syrup for 1 string/thread consistency. One string/thread Consistency is when a thin string is formed between the tip of thumb and forefinger, When pulled apart gently it should not break. 5. Immediately put the flame to low and add the powdered cashew nuts. Instead of spatula you can also use whisk here. Mix well without any lumps. 6. Keep stirring in low flame using a spatula. Now we need to cook Cashew nut powder with the sugar syrup. First you can see the gooey dough as shown in the picture. Keep mixing. 7. At one stage you can see the mixture starts to leave the sides of the pan and starts to form a ball, at this stage take little amount of cashewnut mixture. Using your 2 fingers check to see if it forms a non sticky ball as shown in the picture.If it forms a ball immediately switch off the flame and pour the mixture in the plate greased with ghee. 8. Using a fork mix it well couple of times. It will be super hot so we can not work with it immediately. 9. When you are able to handle the heat, start kneading the dough without giving so much pressure. 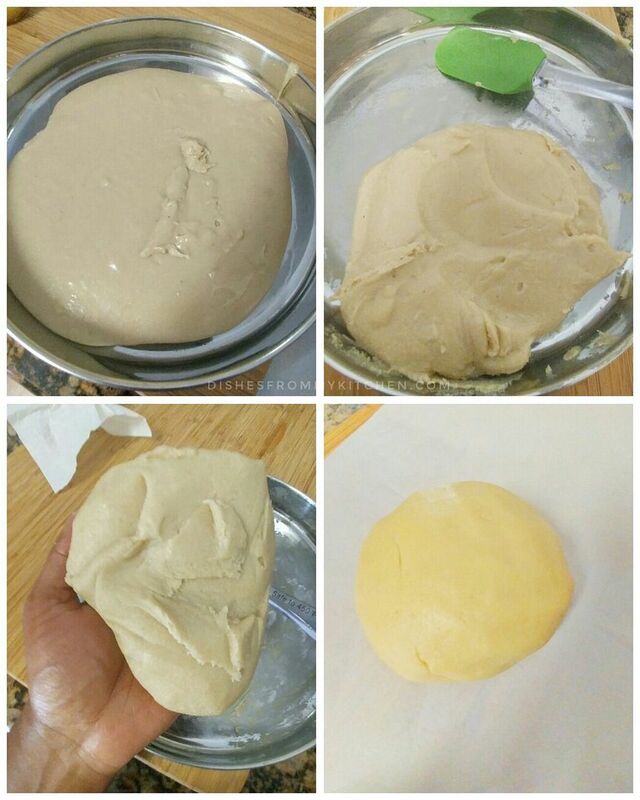 You will get a smooth dough as shown in the picture. It should be nice and Pliable. 10. 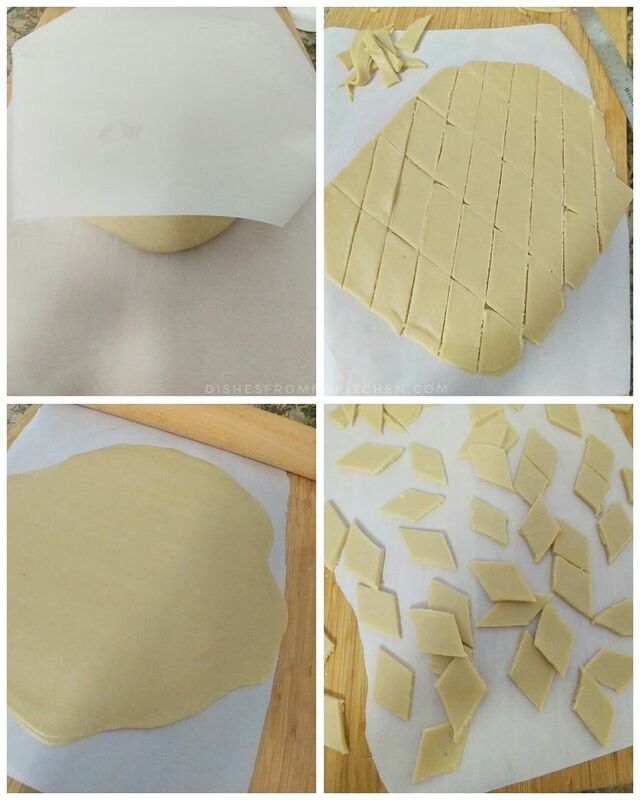 Keep the dough in between 2 parchment paper and roll it using a rolling pin for about 4mm thick..Choosing the thickness is absolutely your choice. Mine is thin the way we like. 11. Now using a knife cut diagonally. Let it cool completely. Store in an airtight container. 1. 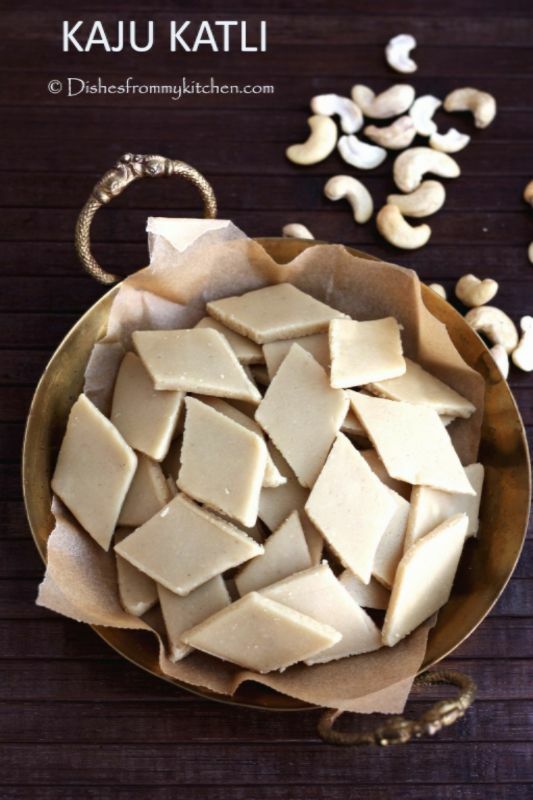 Powder the Cashew nut when it is in the room temperature. Make sure you the Blender jar is completely dry. 2. Like any other sweet, string consistency is very important. If the consistency is more than 1 string, then the katlis becomes brittle or you will not be able to form smooth dough. 2. Once the cashewnut and sugar mixture starts to leave the pan and forms a soft non sticky ball, stop cooking. If you continue to cook longer it will make the dough very dry. 3. As soon as you are able to handle the heat, start kneading the dough to a smooth ball immediately. If you wait longer, it will become dry soon and difficult to roll. 4. If everything is done correctly you will get smooth and Pliable dough, if you feel it is dry add little warm milk and knead again to get smooth dough. If milk is added the shelf life for katlis will be less if kept at room temperature, you need to keep it in the fridge after couple of days. Hope I have given you all the tips that was in the top of my head. Do let me know if you have any doubts. Wow...looks yummy..hats off to ur perfection and presentation! 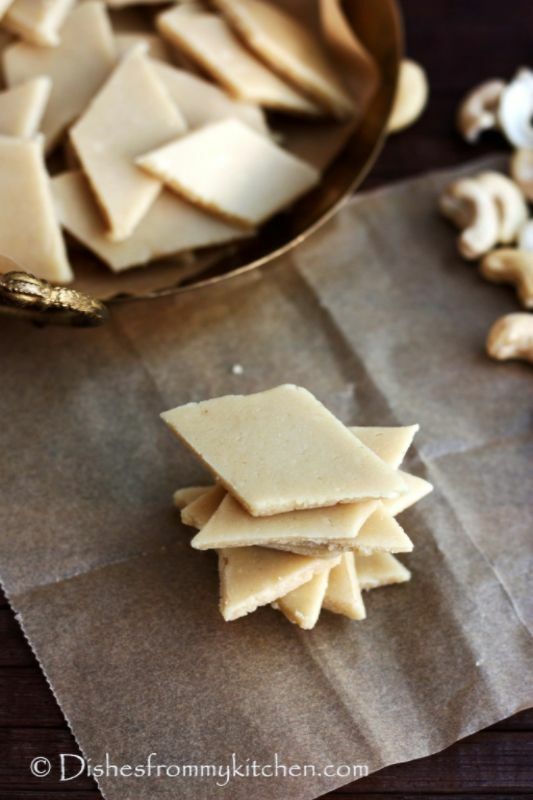 Original and pure, this katli is so sensational for the melt in the mouth texture. Thanks so much dear Sharmi. Yesterday i tried ur recipe ma.. It came out really superb,just like how we get at shops..